Mexico is an amazing place and our Teaching placement will allow you to experience the beauty and cultural richness of the country first-hand. You don’t need prior teaching experience and we don’t require you to have undergone TEFL training. Whether you want to volunteer as an English teacher during your gap year, career break or extended holiday, your presence at the school or university in which you work could make a valuable impact and the stories that you have from your travels will be irreplaceable. With rich natural resources, a mix of indigenous peoples and stunning coastlines, Mexico is a fascinating Central American country. It has a strong tourist industry and Mexicans are keen to embrace the opportunities that come from living next door to the United States. With so much trade and interaction with the US, a good command of the English language opens up many opportunities for jobs, commerce and travel. Living so close to the United States has also meant that plenty of US culture also flows into the country in the form of television and music, and this makes English even more attractive. Therefore, the Mexican schools and universities that we work with are increasingly keen to benefit from the opportunities an English-speaking volunteer brings. The office of Projects Abroad in Mexico is based in Guadalajara, the second largest city after the capital, Mexico City. The schools here often struggle to get teachers who speak fluent English. The most suitable candidates are frequently tempted away by higher salaries in the private sector. You can either work at secondary schools in Guadalajara, or at the University of Guadalajara. In secondary schools the students range from 11 to 18 years-old. At the university students are usually aged from about 18 to 26. An average class in a secondary school consists of thirty students and volunteers are expected to teach for up to four hours per day from Monday to Friday. You can provide effective, practical help with spoken English to a large number of students. You will generally start your placement supporting a teacher, but you will probably feel confident enough to take your own classes before long. It’s always important to achieve a balance with your teaching colleagues as any one-to-one work you do with the students will help them improve rapidly. The main focus is on building your students' confidence in communicating in English. Your life will be fascinating to your pupils; they’ll want to hear all about your hometown and what brought you to Mexico. Chat to your supervisors about any ideas you may have for the students. If you have other language skills such as German or French we would be interested to hear from you, and budding musicians, artists and actors can all add to the richness of our students’ education. Before you arrive in Mexico you will have access to a teaching ideas guide on your personal MyProjectsAbroad webpage that has plenty of suggestions for games and activities that you could try in your classes. We welcome new ideas and encourage you to take the time to prepare and structure lessons. Preparation is the key for getting the most out of your experience. 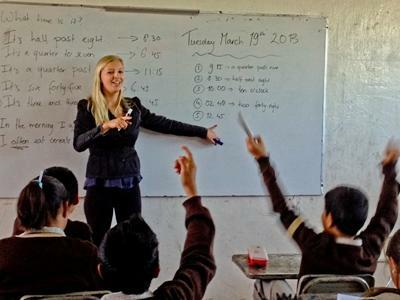 To give extra support to Teaching volunteers during their time in Mexico, a member of Projects Abroad staff organises regular workshops. The workshops will provide you with a valuable insight into the educational system in Mexico and the background of the school where you are working. You will also receive guidance and suggestions regarding planning lessons and activities to carry out at your teaching placement. You can read more detailed information about the aims of the project in our Mexico Teaching Management Plan. Interested in other volunteering opportunities? What about teaching in Jamaica?